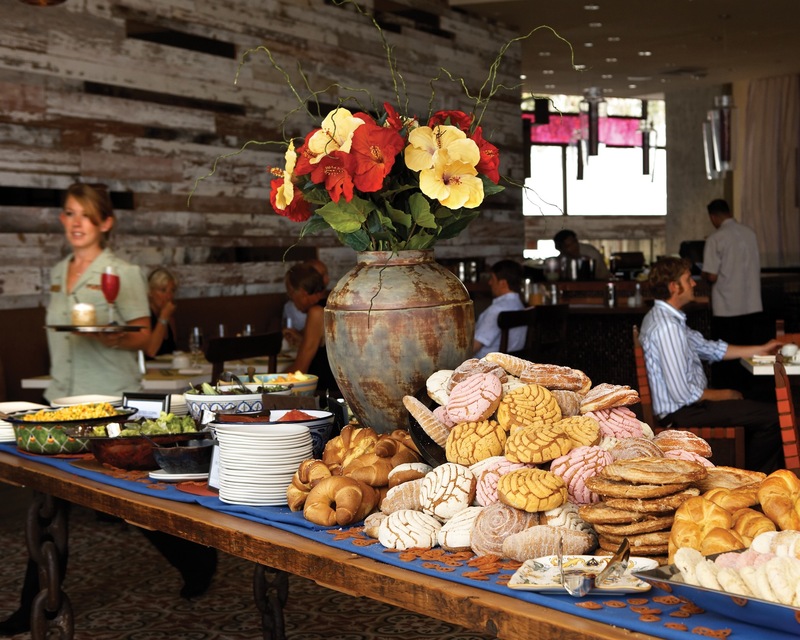 Photo of brunch buffet at Hotel Maya courtesy of Fuego Restaurant. Thanksgiving is fast approaching, and along with it, hordes of hungry relatives waiting to stuff themselves to the brim with mashed potatoes, cornbread and, of course, turkey. At least, that’s the expectation many hold for the holiday. The truth is, though, we don’t all have a chef’s touch and we can’t dedicate our time and money to preparing a lavish, home cooked feast. And hey, there’s no shame in admitting that a glazed turkey is just not worth the impending headaches that come with being crammed in the kitchen for hours with chatty relatives. No need to worry–Long Beach has you covered with Thanksgiving deals and restaurant dining specials everyone can be thankful for. The feast begins as early noon at Fuego, where Thanksgiving brunch and dinner buffets offer a Latin twist to the quinticential American holiday. The dining hall will echo with live Latin jazz all afternoon as the Fuego buffet serves up Latin-enfused food with a view of Pacific Ocean, Long Beach skyline and Queen Mary. The celebration continues into the evening with a dinner buffet where there will be no shortage of choices on the menu, from jumbo crab chalupas to cider-glazed roasted turkey. PRICE: Fuego Thanksgiving Brunch Buffet: $59.95, adult; $29.95, children, 12 and under. Fuego Thanksgiving Dinner Buffet: $50, adult; $25, children 12 and under. An 18 percent gratuity fee will be added to parties of six for brunch or dinner. Don’t expect to find shorts, flip-flops or baseball caps at the Sky Room’s Thanksgiving dinner, which will serve a fancy holiday meal with one of the best views in the city. The dress code is business casual and the food, prepared by Executive Chef Juan Carlos Olvera, will range from lobster rissoto to roasted turkey. The price can be a little steep for the whole family since children are not discounted, however, the three-course meal is worth the price if you’re seeking a classy Thanksgiving meal without the stress of dirty dishes after. WHERE: The Sky Room at 40 South Locust Ave. If you want your classy Thanksgiving meal to come earlier in the day, Parker’s Lighthouse is serving up its special three course holiday offerings starting at 11AM. However, if you’re expecting some of Parker’s typical marine-based fare, it’s best to come back during regular business hours as this special event is more “turf” than “surf” with filet mignon, turkey and pork flat iron all on the menu. Children can also eat on the cheap thanks to an a la carte roast turkey option for children under 12. RESERVATIONS: Required. Call (562) 432-6500 or purchase online. As always, the Queen Mary’s on-board dining options will bring a first-class flair to the holidays with four separate ways to eat your fill of Thanksgiving fare on the ship. The award-winning Sir Winston’s Restaurant and Lounge will bring a serenade by pianist Scott MacDonald to a gourmet meal. Chelsea’s Chowder House and Bar offers exactly what the name says, plus some roasted turkey. For those looking for a wider selection, the Thanksgiving Champagne Brunch offers more than 50 dishes from around the world, from albondigas and chile rellenos to cobb salad and Asian-style ribs. Finally, the Promenade Cafe is the only room that requires no reservations and will have a “holiday station” stocked with turkey, cornbread, mashed potatoes and more. The Observation Bar will also be open regular hours, so stop by for a drink on your way out. RESERVATIONS: Sir Winston’s Restaurant and Lounge; Chelsea’s Chowder House and Bar; Thanksgiving Champagne Brunch. Promenade Cafe accepts walk-ins. Known for its Spanish cuisine, Sevilla Restaurant turns towards a more classical Thanksgiving with a three-course meal including squash soup, ham or salmon and a pumpkin creme brulee. Not up for eating out on Thanksgiving but still don’t want to cook? It’s not too late to by a bird at a reasonable price from the new Gelson’s on PCH and 2nd St. Print this coupon for $5 off a turkey less than 20 lbs, or $10 off for more than 20 lbs at a Gelson’s super market.